2K released a new NBA 2K19 screenshot. This one featuring Giannis Antetokounmpo, with an overall 94 rating. Let us know what you think. Below are some of the other NBA 2K19 screenshots and player ratings that were recently released. 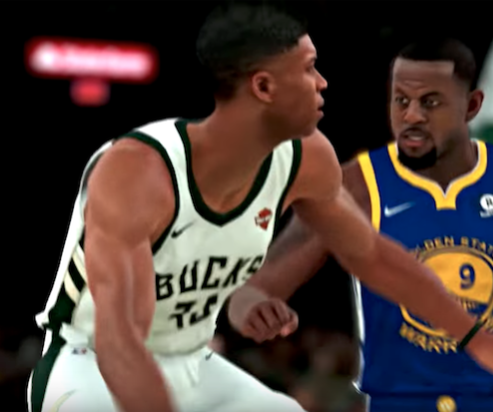 LeBron is the NBA 2K19 20th Anniversary Edition cover athlete releasing on September 7, while Giannis Antetokounmpo is cover athlete for the NBA 2K19 Standard Edition, releasing on September 11. He’s a 94 because he’s listed as a SF in game. The roster team SHOULD have him listed as a PF but doesn’t look like it’ll happen. Hopefully the roster team will look to recalculate how they average the overall for players. Currently the scale hinders stretch 4’s & Athletic non rebounding PF’s. That is why you see such a change in overall when switching Giannis from SF to PF along with any shooters who are SF now playing PF. Do you think, he deserves more accurate muscle mass? That photo of him and his brothers flexing the other day probably made the 2K art department all let out a burst of expletives knowing how much more static they're going to get from the fans now. Versatile enough to play all five positions on both sides of the court (though poor shooting makes him a less than ideal wing). If the jumper ever develops he'll be unstoppable. While improved, after five seasons he is still a terrible shooter. This facilitated his move to PF, where his frame can be an issue at times defensively. That's not how big he is. He's lean and has long arms/biceps. He's not as muscular as someone like Andre Iguodala or Eric Bledsoe. He’s definitely gone beyond lean at this point. You can say the arm is fully contracted so it accentuates the mass, but that’s bulk. I think this picture is a little deceiving though. Dude looks big no doubt but most people are going to look a little bigger when they're getting a pump at the gym and holding heavy dumbbells. In most cases on the court he's not going to look as big unless he's flexing. Working out with a pump going, literally holding weight and flexing in the picture is going to make him appear much larger than he does on the basketball court. I'm going to go out on a limb and guess that he will look about the same size this year as he did last year. Which is still a lean muscular guy. As a guy that works out too much, that picture is very deceiving. My pump after a grueling workout compared to my muscle definition on a normal day is a huge difference. He’s holding at least 40 lbs weights AND he just finished working out. Even the bros looking swollish..
He’s a lean muscular build and does not have a body like a body builder.. He does have a muscular body for a basketball player though. I'm not sure this is the best screenshot to go by to determine muscle definition. Even ripped people aren't going to look ripped if their arms are by their side and muscles are relaxed. 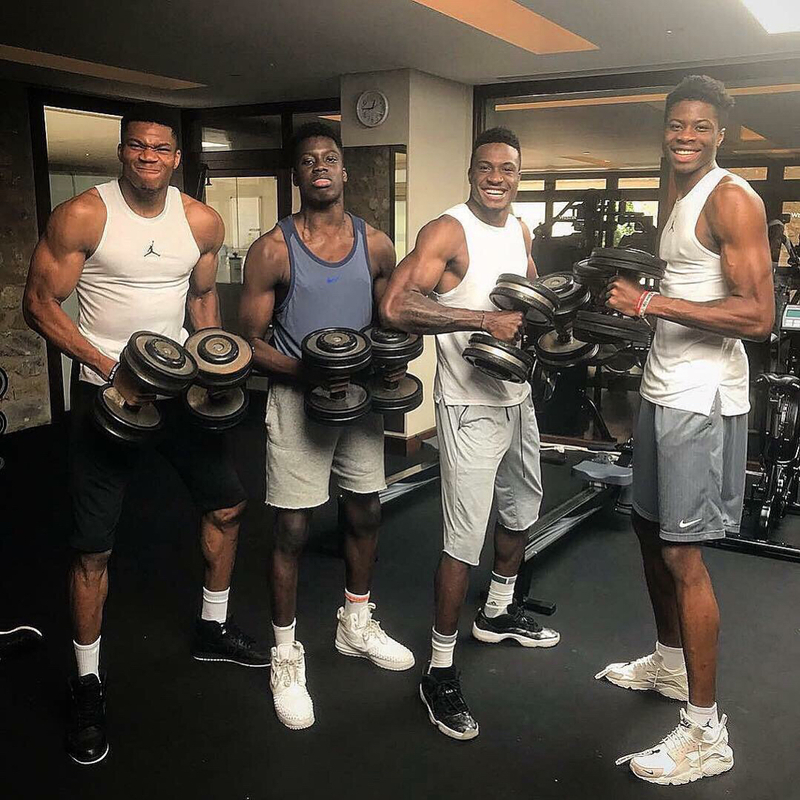 Hope this link works, but in this real life picture of Giannis there is little to no muscle definition because he isn't flexing similar to the screenshot. 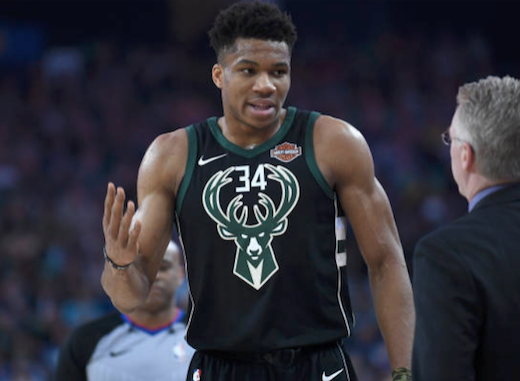 Now if we see a 2k19 screenshot of Giannis throwing down a monster jam or celebrating in a way that would cause his muscles to flex and he still has zero muscle definition then I will 100% agree with you. I just don't think this particular screenshot is a fair indication of muscle definition. Yh was just about to say this. If you workout you know during and after a workout you got the "pump" going. I'm sure that's why he look bigger in that pick. He's definitely added some muscle mass since he came in the league, but he doesn't have no body builder look or anything. With PC mods, no less, to give him proper definition. The screenshot should be a good representation. He is yelling in the screenshot, which is usually accompanied by flexing. Even the picture you posted where he isn't flexing has more definition than the screenshot. need more definition. he's ripped. the one on the left has no definition whatsoever. I don't get why everyone has a pinkish tone to them ? The muscle definition is lacking as well..
arms could be more cut, but I’d assume bigger issue is his length. This is 2k18.